Welcome! Today is my very first creative share for StencilGirl and I am very OTT Excited. I would love to share with you a canvas that I created using, what I know will be a fave, the StencilGirl Klimt Forest Stencil, designed by Cathy Taylor. I chose to use this stencil to help me create my canvas as I was very much inspired by a quote that I found on-line by Thomas Paine an English-American political activist, philosopher, political theorist, and revolutionary. One of my favourite things to do, is to get online and 'Google' stuff; that is how I found the quote that inspired this canvas. "Everything that is right or reasonable pleads for separation. The blood of the slain, the weeping voice of nature cries, its time to part." I must confess that I do not know how this quote is meant to be interpreted, but what immediately came to my mind after reading it, was an image of a Weeping Forest. 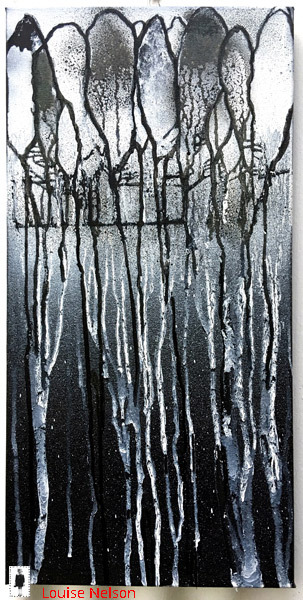 So I set about creating that mental image of a weeping forest on canvas. 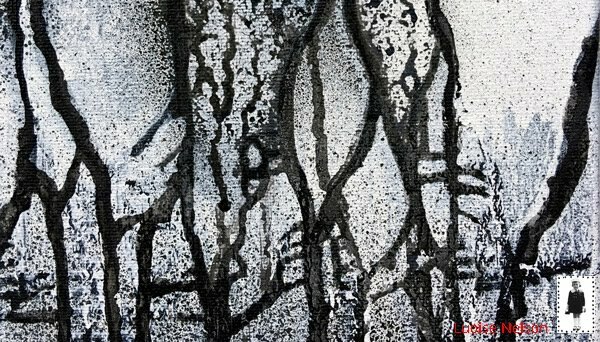 All of the painterly 'dripping' techniques that I used to create this canvas, I hoped would reflect the image of a forest crying, weeping tracks of tears. Klimt Forest Stencil Mask Designed by Cathy Taylor. 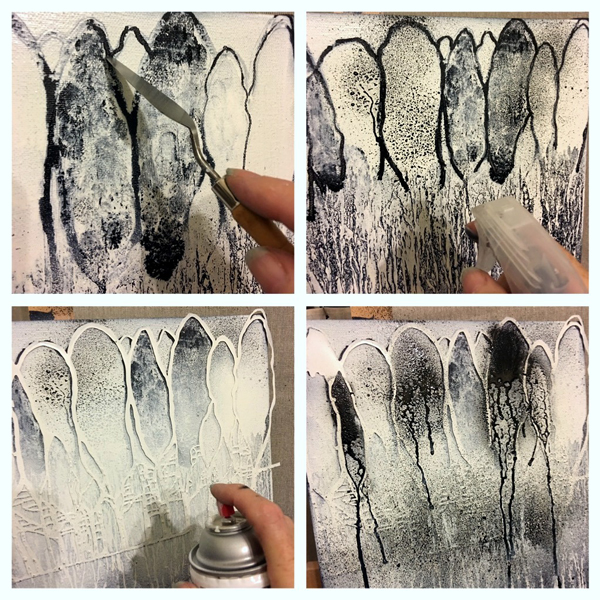 I thought it would be fun to include a few step images on how I created this canvas so I have included 2 collages of 8 step out images; with brief step-by-step descriptions underneath. I began by applying a coat of black acrylic paint to the canvas. Whilst the paint was still wet I applied the stencil to the top portion of the canvas. I then over-sprayed the stencil using spray gesso. While the gesso was still wet, I started to remove some of the spray gesso from the trunk portion of the trees with a water mister. This assisted the gesso to run down the length of the canvas to create lines of white on the black background. 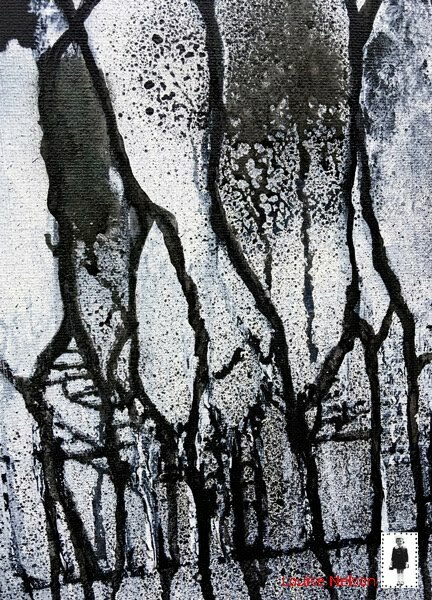 To help create the illusion of foliage I dabbed my finger into the wet gesso of the treetops. 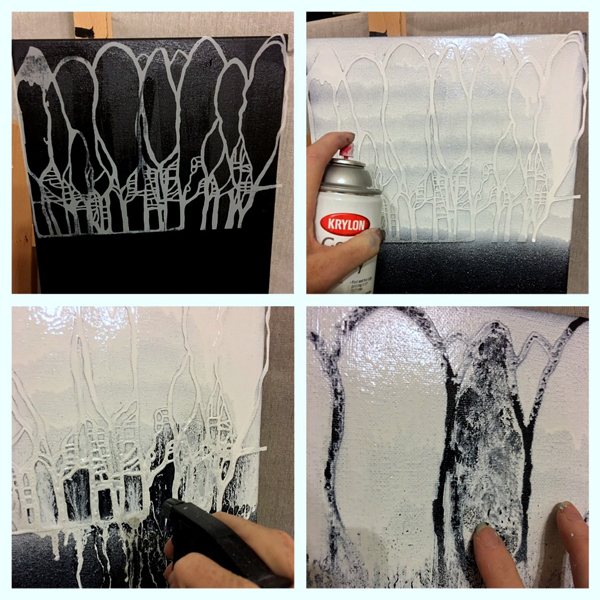 While the gesso was still wet I re outlined the tree stencil pattern using a slim palette knife. To create the illusion of foliage on the remaining trees I applied a spray mist. I applied this liberally so that it would drip and run down the canvas. To redefine the tree trunks I applied the stencil again; applied another light coat of spray gesso and another coat of spray mist. I do hope that you have enjoyed this; my first creative share for the fabulous StencilGirl! Oh my! The techniques you used matches the story. Love it! Oh this is soooo gorgeous, I love it!